The 1000 Mile Ultimate Technical Racing Trainer Socklet is state of the art technical. Perfect for racing and a ultimate summer leisure sock. The Tactel® inner layer stays with the foot, wicking away moisture, whilst the outer moves with the shoe. The lack of friction between the layers helps prevent blisters and reduces wear. Arch braced for extra support. Top venting for superior breathability. Available in men's and ladies' fit. Covered by The 1000 Mile Guarantee! 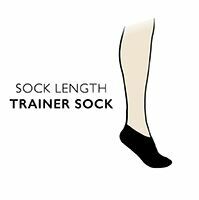 Double layer construction eliminates friction between shoe and sock, thus reducing friction between sock and foot, The skin should therefore not be rubbed by the socks, meaning no wear out for 1000 mile of use and no blisters. Money back or replacement if, within one year from date of purchase, either you experience blisters or the socks wear out within 1000 miles, provided care instructions have been followed and socks are returned with original receipt.